I recently returned from a visit to the modern-day land of Israel where I spoke to believers at some messianic congregations, as well as at a youth camp and a student camp. At one of those events someone handed me a few copies of Andrew Lessey’s small booklet “The Heart of Israel”. The following is drawn from that booklet. During the 1990’s about 2 million Jews from Russia and other ex-soviet countries returned (made the Aliyah) to Israel. However, not only have Jews come from the north they have been returning from all countries around the world. The return started in the late 1800’s and has been ongoing ever since. The rise of the Third Reich under Adolf Hitler’s Nazi Germany accelerated arrivals both pre and post World War II. God’s promise as indicated by verse 15 was to their fathers and that promise still stands. As small as it is today one wonders why so much media attention is focussed on Israel. The message one hears in the western media, outside the country, is very different from the reality on the ground, inside the country. One American who has spent a lot of time in Israel and who drove us from Modi’in to Jerusalem mentioned that, despite the media to the contrary, Israel is one fo the safest places on Earth to live. Nevertheless Israel is surrounded by hostile nations who want to annihilate that tiny nation, which has only a few more Jews today than the 6 million Jewish people Hitler murdered with his Final Solution. The rest of the Israeli’s are about 2 million Arabs, who are largely Muslim with some Christians and Druze. What does the Bible actually record on the promises made to the Jewish forefathers, the Patriarchs, regarding this land? Here we see the promise was made by God to give the land to Abraham’s (he changed his name from Abram) offspring. At the time this promise was made, Abraham was at Shechem (Sichem) or modern-day Nablus. Nablus (Shechem) is located in the West Bank, in the region known biblically as Samaria. 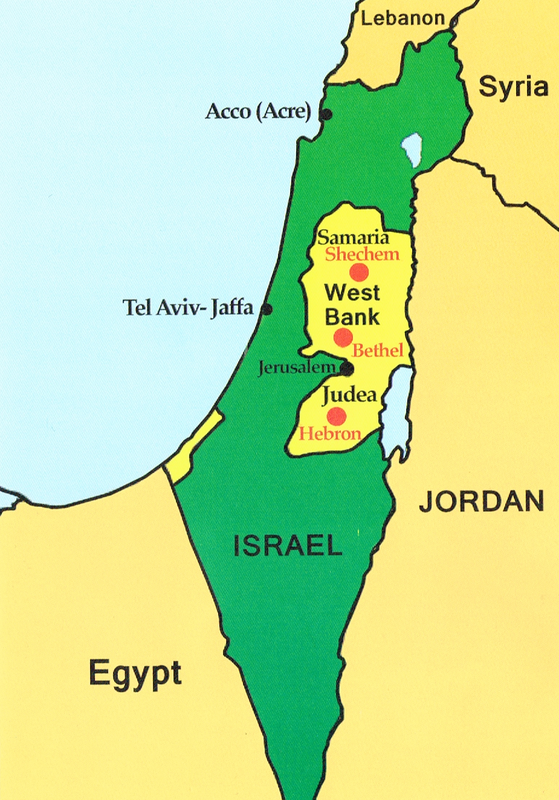 The West Bank (of the Jordan River) is land captured by Israel from Jordan during the six-day war in June, 1967. It was never part of a country called Palestine. Genesis 13:14,15 And the LORD said to Abram, after that Lot was separated from him, Lift up now your eyes, and look from the place where you are northward, and southward, and eastward, and westward: 15 For all the land which you see, to you will I give it, and to your seed for ever. Again we see God make a firm promise to give all the land that he can see and He gives it to him forever. But where was Abraham when this promise was made? To Abraham’s grandson Jacob, who God changed his name to Israel, God promised this land. At the time this promise was made to Jacob, where was he? Genesis 28:18,19 And Jacob rose up early in the morning, and took the stone that he had put for his pillows, and set it up for a pillar, and poured oil on the top of it. 19 And he called the name of that place Bethel: but the name of that city was called Luz at the first. Thus the Scriptures tell us Jacob was at Bethel. In summary then, Bethel, Hebron and Shechem (Nablus) are all located with the confines of the lands of Judea and Samaria, which are largely encircled by the land that is contested today—the West Bank. These verses while clearly making a claim to the lands of Judea and Samaria as given by God to the children of Abraham, Isaac and Israel, they are not the only verses. At no point do the Scriptures state that the lands given by God were along the coastal strip around Jaffa (modern-day Tel Aviv) or Acre (in the north). Even though all the land shown in green in the map above, including the West Bank in yellow, was originally part of the land of the Canaanites given to Israel (through Moses) by God, Judea and Samaria are the heart of Israel. Jerusalem and, for a time, Shechem were the ancient capitals of the nations of Judah (Judea) and Israel (Samaria). The sun setting over the old city of Jerusalem, set high on the mountain of Zion, Mount Moriah. Clearly these verses confirm the promise of the land to Israel. They include the words “forever” and “everlasting” are used. This confirms that these promises were not temporary nor conditional, as some who promote the profane replacement theology must teach. Even if you reinterpret the Hebrew word עוֹלָם (owlam), in verse 8, translated “for ever” and “everlasting” (in KJV), you could only render it as “eternity” or “time out of mind.” You cannot get a temporary or short period of time. The book of Ezekiel contains further revelation regarding the Lord’s plans for the Land. In chapter 36 verse 1 the prophet is commanded to speak to the mountains of Israel. As we delve deeper into the chapter we begin to see His purposes for those mountains. The following verses make it clear that the Lord intends that multitudes of His people live on those mountains. But where are the mountains of Israel? Is the Lord referring to Mount Tabor, Mount Carmel, Mount Hermon and the Golan Heights or is he perhaps referring to the hills of the Galilee? Well, actually the term “mountains of Israel” again refers primarily to the mountains and hills of Judea and Samaria (the West Bank). Obviously this fact only serves to reinforce the reality that Judea and Samaria are actually the heart of the Promised Land. Consequently we shouldn’t be surprised therefore that the Lord wants multitudes of His people to live in that area of the land. Nor should we be surprised that the pagan nations of the world, even those allegedly Christian, but really secular, nations actively oppose it. Obviously the Scriptures listed above indicate that not only is this not God’s will, but it is actually in complete opposition to it. The fact that Jerusalem itself is situated on these mountains is no coincidence. Neither can it be considered a coincidence that the three Patriarchs are all buried on these mountains, at Hebron. Clearly these factors again strengthen the reality that this is the very heart of the Promised Land. Sadly the nations of the world are so deceived on this matter that whenever plans are announced to build homes for Jewish people in this territory (the West Bank), the government of Israel is harshly condemned. In addition, intense pressure is directed against Israel in the hope that these decisions will be reversed. Often world leaders proclaim that such moves violate international law. Obviously that depends on how international law is interpreted. It certainly seems that these pronouncements are made without due consideration of certain relevant legal factors. Nevertheless, as believers in Christ Jesus the Messiah, we know that God’s promises far outweigh any man-made laws. Therefore the ongoing actions and attitudes of the nations actually put them in great danger. Indeed, it is not an exaggeration to say that they are in fact on a collision course with God. As we dig further into Ezekiel 36 it is important to take note of the consequences of this Jewish return to the Land and in particular to the mountains of Israel. Clearly the results are of great significance. In summation they are a restoration of the relationship between the people of Israel and the God of Israel and His Son Jesus. God will bring them to a saving knowledge of Himself when He wipes away the blindness from their eyes. Romans 11: 23-27 And they also, if they abide not still in unbelief, shall be grafted in: for God is able to graft them in again. 24 For if you were cut out of the olive tree which is wild by nature, and were grafted contrary to nature into a good olive tree: how much more shall these, which be the natural branches, be grafted into their own olive tree? No wonder the powers of darkness so intensely resist the movement of Jewish people into Judea and Samaria (the West Bank). This heralds the last days when the Lord re-establishes them in the Land and finally he brings a saving knowledge to His own chosen people. There has been a clear increase in saved Jews in Israel. When I first visited in 2006 the estimate of messianic believers was about 7,000, but 10 years later (in 2016) the estimate has grown to about 20,000. I know these numbers are not well known but there is evidence of a decisive increase. Hopefully for those who pray for the Land and People of Israel, this study will bring encouragement and perhaps additional revelation. Obviously it’s important to pray for the ongoing return of the Jewish people to the Land. However, in light the revelations in God’s Word it would be especially fitting to pray that increasing numbers of them along with native born Israelis would take up residence in Judea and Samaria. From Romans 11 it would appear that the current Jewish population there is only a tiny fraction of the multitudes God plans on establishing in the Land and saving through a knowledge of His Son, Yeshua. The unbelieving Jews call Him ‘Yeshu’, recognising Him as an historical figure, but using His name as a curse word. The saved Jews call their Lord, ‘Yeshua’ HaMashiach (the Messiah). Clearly we can expect to see the Lord increase the number of both Jews and saved Jews in the Land of Israel. Quite possibly He will use Aliyah (the return to the Land of promise) along with future events and their consequences to facilitate this. Let us pray for God’s will in this matter. This entry was posted in Bible prophecy, Biblical doctrines, Israel and tagged Abraham, Bethel, everlasting covenant, Hebron, Jerusalem, Jesus Christ, Judea, Land of Israel, promised Land, Samaria, Shechem, West Bank, Yeshua. Bookmark the permalink. 1 Response to Where is the biblical land of Israel? Personally, I’ve obtained far better clarity concerning the Covenants when seeing these within a logical framework of understanding how God has dispensed His Will based on the specific Covenants. Yes, Dispensations – in spite of what Scofield, or others, may have said (I’ve not read Scofield).. In my case, I’ve enjoyed the clarity obtained from A. Fruchtenbaum concerning both subjects (Dispensations and Covenants). I’ve attached both studies herewith – and you can let me know what parts of it you consider wrong or unsound. In these it is explained that the dispensations are simply a way in which the Bible can be divided so to understand the parts, as well as the whole. It’s about stewardship, in which God – in separate periods of time – dispenses His Will in a specific and unique way, based on the Covenant upon which a particular dispensation was founded. Herewith a brief synopsis of the attached studies, from the Jewish Messianic perspective with which I concur (without substantive reason not to). According to this the Bible can be divided in 7 Dispensations: (1) Innocence or Freedom – Gen. 1:28 – 3:8; (2) Conscience or Self- Determination; (3) Civil Gov. – Gen:15 – 11:31; (4) Promise or Patriarchal Rule – Gen. 12:1 – Ex. 18:27; (5) Law: Ex. 19:1 – Acts 1:26; (6) Grace – Acts 2:1 – Rev. 19:21; and (7) The Kingdom or Millennium – Rev. 20: 1 –10. * Importantly, it is in the final Dispensation (the Messianic Kingdom) that there will be the fulfilment of all the OT prophesies. Concerning the covenants, based on this study, the Bible comprises 8 covenants: 6 unconditional (“I will”) & 2 conditional (“if you will, then I will”). Five covenants are exclusively with Israel, three with mankind in general. The Dispensations may come to an end, but – importantly – the covenants often continue. Unconditional: (1) Adamic; (2) Noahic; (3) Abrahamic (exclusively Israel); (4) Land Covenant (still very much in effect! ); (5) Davidic (with Israel); (6) New Covenant (exclusively with Israel). Foundational to the New Covenant is Jer. 31:31 – 34, of which the participants are God and Israel (also Rom. 11:26-27) – not made with the Church (v. 31). The study explains how the relationship of the Church to the New Covenant has often been a topic of confusion, because on one side Jeremiah clearly states it is with Israel, whereas several Scriptures connect the New Covenant to the Church. This has led to the most popular solution of ‘Replacement Theology”, i.e. the notion the Covenants are now all fulfilled in the Church. But because it is obvious the promises are not fulfilled literally, using an allegorical interpretation, it is said the covenants are fulfilled only spiritually (of course in the process ignoring the Land Covenant entirely). The solution is clearly explained in 2 passages, Eph. 2: 11 –16 (“ and broke down the middle wall of partition”); and Eph. 3:5 – 6 (“the Gentiles are fellow heirs”) – being the ‘partaker’ principle (in stead of ‘taker-over’). Grafted-in (Rom. 11: 17, 24), but the olive tree still belongs to Israel. In conclusion, the Church enjoys the spiritual blessings of the Covenants (e.g. salvation benefit), not the material and physical benefits. And so the physical promises still belong to Israel, especially involving the Land – to be fulfilled exclusively with Israel, but spiritual blessings now shared by the Church (hence we are also indebted to the Jewish believers – e.g. Rom 15: 25-27). And – of course – the blood of Christ is the basis of salvation in the New Covenant: ratified, signed and sealed (Heb. 8:1 – 10:18). The study notes that indeed it is true that the New Covenant is not now being fulfilled with Israel – but neither is it by the Church (p. 39).